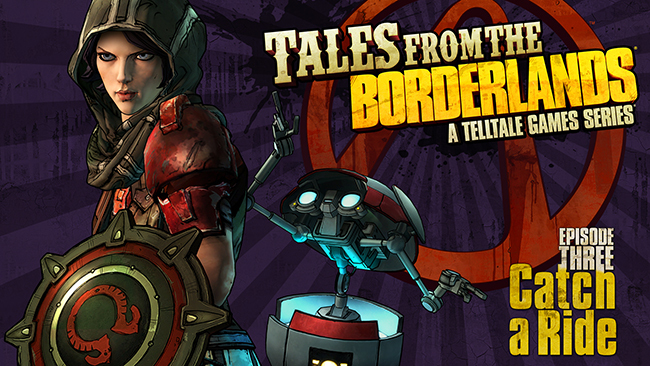 We are officially mid-season into Tales from the Borderlands, and we get one of the best episodes yet in episode three, “Catch a Ride.” There is action, romance, murder, and a few new additions to the team. The stakes are raised and the situations are more life and death, which makes it all the more exciting. In this episode, the game proved to be a little more challenging, not that I minded. There were several split-second, timed elements that needed your full attention. Up to this episode, I always knew dying in the game was a distinct possibility. You would miss a command, get killed, and then reawaken at your last checkpoint to try all over again. Prior to episode three, that hadn’t happened to me. Then, as soon as I was forced to run for cover from automated turrets, I died several times. It was as frustrating as it was exciting because, for the first time since I started playing this game, I felt challenged. I felt like Tales of Borderlands still had a few things to teach me. This lesson wasn’t a fluke occurrence, because it happened as I was hanging upside down trying to reach for my gun and letting off an elemental shot of my choosing. I was half a second too slow. The command screens were starting to pop up in an atypical manner, sometimes catching me off guard. It might sound like I’m complaining, but it was a refreshing change-up. Change-ups are the theme of this episode, since the majority of it takes place in an Atlas greenhouse ecosystem nestled inside of a giant dodecahedron. We get a nice reprieve from the harsh climates and merciless desert that we’ve experienced so far. The flora and fauna are beautifully intoxicating, even though more than a few of them might try to kill you. It is a great change of scenery, shifting the tone of the story from surviving to thriving by showing things in bloom. Meanwhile, the plant life isn’t the only thing blooming. When Rhys (Troy Baker) and Fiona (Laura Bailey) separate, each of them gets a chance to show us a deeper side of them. With Rhys, we see the budding romance between him and Sasha. We see a more genuine side of Rhys that we didn’t even know existed. Fiona heads off with new team mate Athena, where she is forced to hone her true talents and maybe come to the realization that she has the mettle to be a great Vault Hunter herself, which, it turns out, Felix may have thought all along. Great character development and a strengthening of relationships happens in this episode, which makes us wonder how Rhys and Fiona got into the predicament they are currently in at present. The best addition to the game, aside from the hole in the stomach Vasquez (Patrick Warburton) got when I played, was Gortys (Ashley Johnson). Turns out Gortys is a partially assembled robot meant to find Vaults around Pandora. Gortys is essentially a baby, every experience being his first, making him not jaded to Pandora’s hostile environment like everybody else. He brings a leavening humor with his naivete and ecstatic energy. Loader bot was one of my favorite characters, but Gortys is starting to give him a run for his money. Why I’m rooting for the robots over the humans probably says a lot about me as a person, but I also think the comic relief they bring to the group’s constant near-death experiences creates a good contrast that truly makes the story great. Gortys alone makes this episode my favorite so far. With the help of the last Atlas employee left alive, Cassius (Phil LaMarr), they are able to get another one of Gortys’ components. They victory is short-lived when Vallory shows up with Vault Hunters Brick and Mordecai and take down the entire group. As high as they rose earlier, they sunk just as low at the end of the episode. Fortunately, it looks like they are going to reach new heights when Gortys reveal that location for his next part is on Hyperion’s moon base, Helios. Next ArticleTV Review: Orange Is the New Black (3x11) "We Can Be Heroes"